The Ontario Steelheaders enjoy two steelhead rainbow trout derbies each year at Denny’s Dam campground on the Saugeen River. 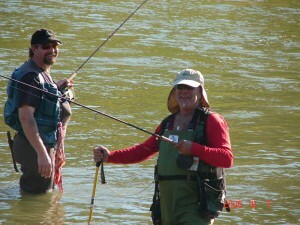 The first fishing derby is early in May after the spring trout opener and the second is in October. Both derbies are held at Denny’s Park on the Saugeen River near Southampton. Dinner is served at the Rod Jones Pavilion, where we have draw-prizes, raffles, merchandise, club updates, guest speakers, derby prizes and biggest steelhead trout trophies are awarded. Overnight camping and day use at Denny’s Park on the Saugeen is available for appreciation day participants and their families. Membership applications are also accepted at the ceremonies and merchandise such as hats, t-shirts and jackets are available for purchase. Typically, the spring steelhead derby is held on the Saturday following the Ontario Regulation Rainbow Trout Opener. Typically, the fall steelhead trout derby is held the Saturday following Canadian Thanksgiving. This social event begins early morning, for a day of fishing the river and wraps-up with dinner, raffles & awards. Registration is available at Denny’s Park. Look for the signs in the park.